The MacKillop Careers Reference Service operates as an integral part of the College’s student counselling services. 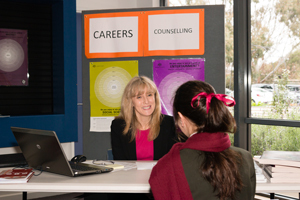 The Careers Counsellor is available to students and parents, through an appointment system. The Careers Library is regularly updated to ensure our students have access to the most current information. A wide variety of materials are available in the form of books, institutional handbooks, pamphlets, DVDs, videos and computer programs. Appointments with students/parents to discuss career pathways.